Large 3,200 square foot unit, upper level of a duplex. 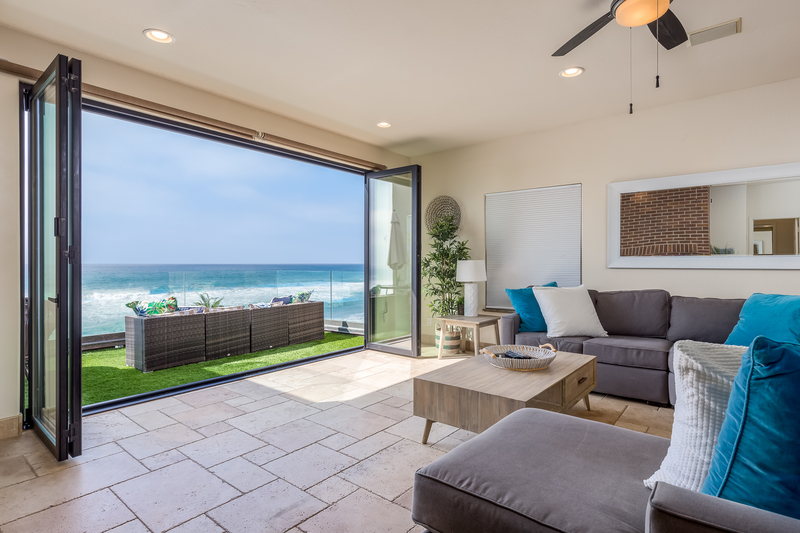 This unit has a fully furnished kitchen with granite counters, travertine flooring, and large and open dining/living room with a fireplace that opens up onto an oceanfront balcony with a private spa. 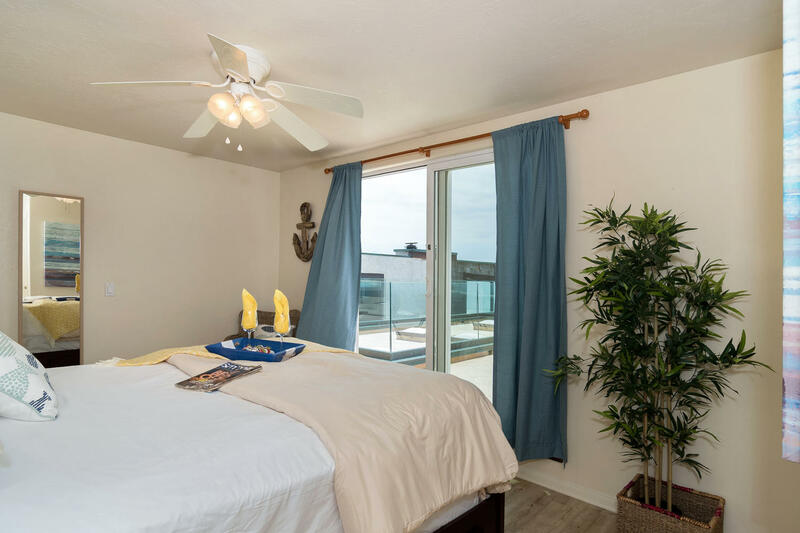 There is balcony access also from the master bedroom, which boasts a huge ensuite bathroom. 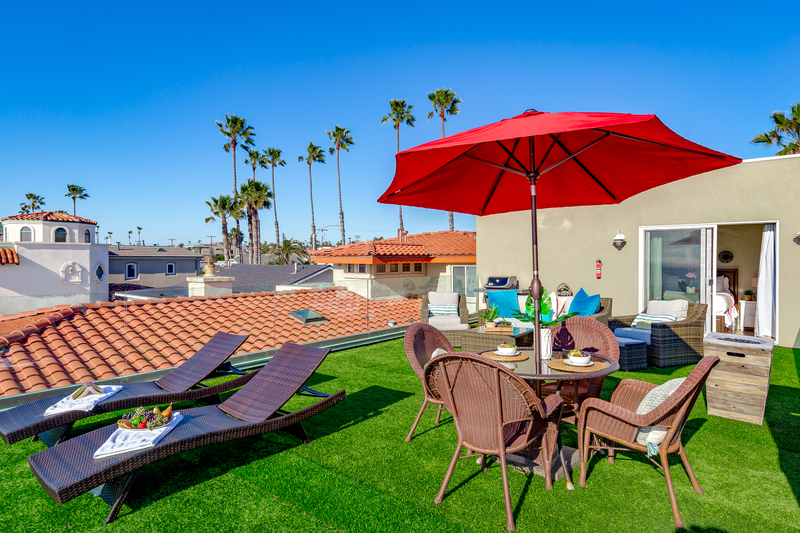 Upstairs, there are two bedrooms, which both have access out to the rooftop deck, with sweeping views of the Pacific Coastline. 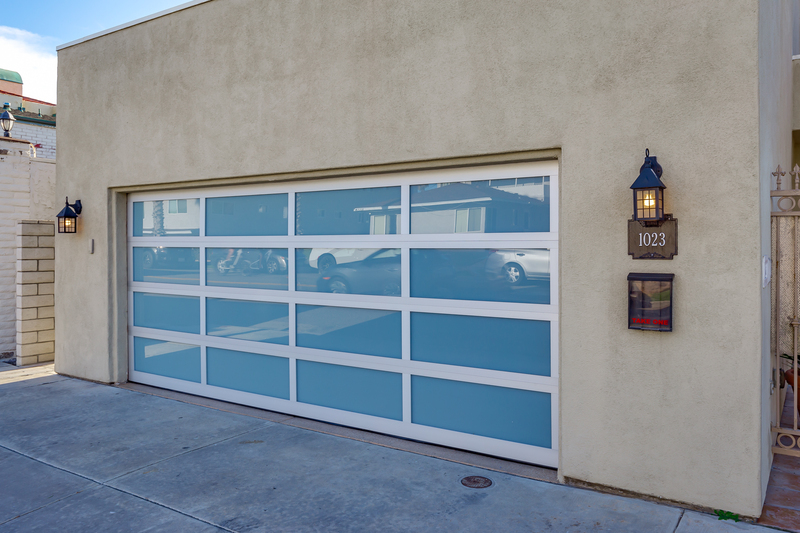 This property does feature a 2 car garage, but additional parking is available at our office in Oceanside, located at 1640 Oceanside Blvd, Oceanside, CA 92054. 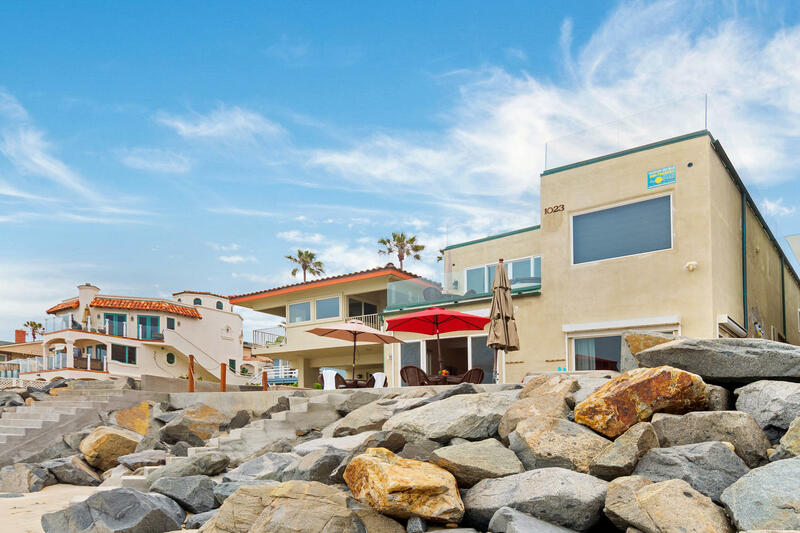 This home is located in the coastal town of Oceanside, where the beaches are nothing short of spectacular, with wide sandy beaches and gorgeous waters year-round. 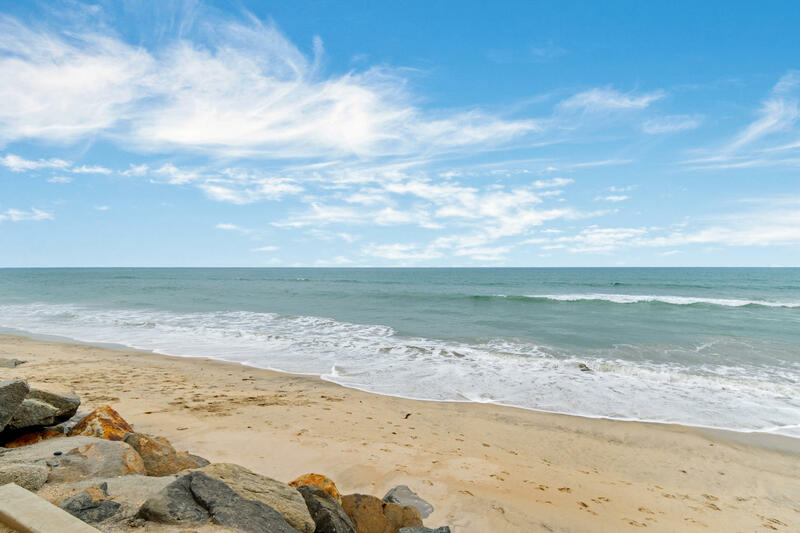 After a day at the beach, take a walk to the pier - wander down and either watch the surfers, go fishing, or take a sail boat out at the harbor. 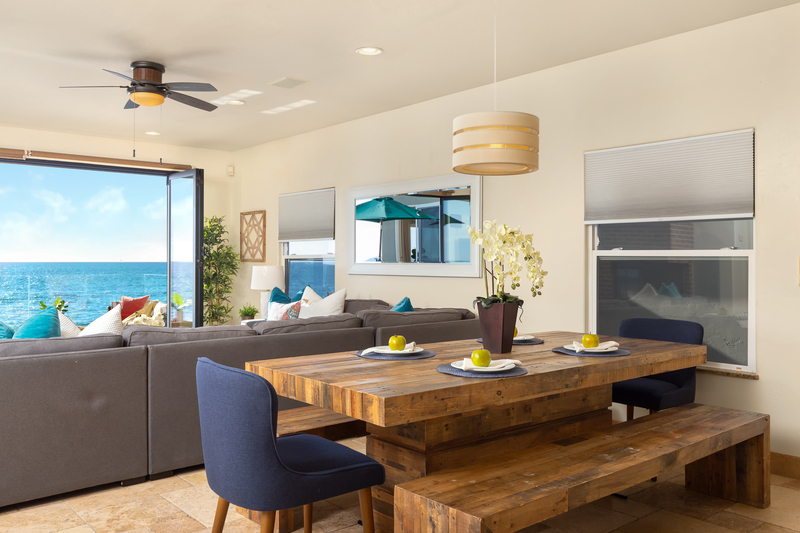 When it is time for dinner, there is an endless amount of delicious restaurants and cafes for you to choose from, but many choose to cook their meals at the vacation rental. 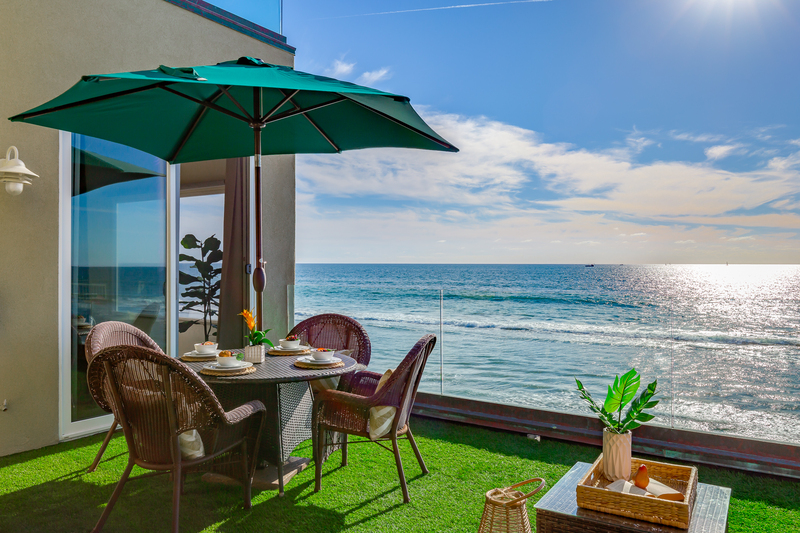 Life doesn't get much better than having your close friends and family around, enjoying a glass of wine, preparing a scrumptious meal as you watch the sun go down on the horizon of the Pacific Ocean. Fall asleep to the sound of the lulling waves, wake up and do it again. It was lovely and serene. We didn’t want to go home even though we only live 10 miles away. It was really cool to see the seagulls and pelicans fly by at the 2nd and 3rd story windows. It was during our rainy season, but it was beautiful to see the storms come in. The winter tides stay pretty high, but you can walk a few blocks and have a sandy beach to walk on. Falling asleep to the sound of waves crashing on the beach, toasting the sun as it dipped below the Pacific each evening from our rooftop terrace, walking down to the pier for some interesting food and local cuisine, having plenty of room for everyone to be together in a beautiful space--these were my favorite things. I have already booked for next year...! I love this house! I believe I have rented it at least seven times, that being said obviously it’s my favorite rental. Two things that have changed over the years that are slightly disappointing are the bed configurations and lack of beach. When I first started renting this house there was plenty of beach making it very easy to allow families with children access to a private beach, this is not the case anymore which is disappointing. Secondly they used to have a second king bed in room upstairs with a separate bunk bed, now it is two full size bunk beds. Now with no beach I probably won’t rent again with my children but have rented for adult vacation. Downfall is house is expensive and BUT affordable to split between three couples, but who wants the full size bed? Love that you can hear the waves and have an amazing view but be prepared to haul beach gear if you want to touch the sand. The beachfront team is amazing and that has not changed! Nancy has always been extremely helpful! Thank you for the review Lisa! We are so happy that you had such a great time at our beachfront property and are honored that you have been back 7 years in a row! We appreciate your feedback. 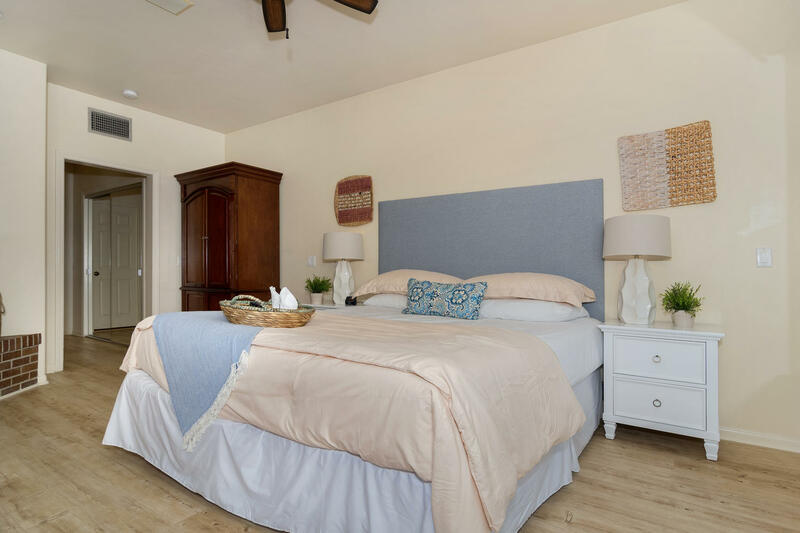 We post all floor plans of all of our properties on our website so people know exactly what the layout of the bedrooms are and what beds/furniture are in them. Also, we are sorry about the beach situation. There is usually beach there, but there are a couple of months per year when the tide is very high and there is less beach. For future reference we have tide charts on our website so you can check the time frame that you plan on coming before booking. Enjoy the year and we'll see you again soon! This is the second time I have rented this property. My family loves staying here. The parking garage opens up into the unit making it easy to unload and load our belongings. 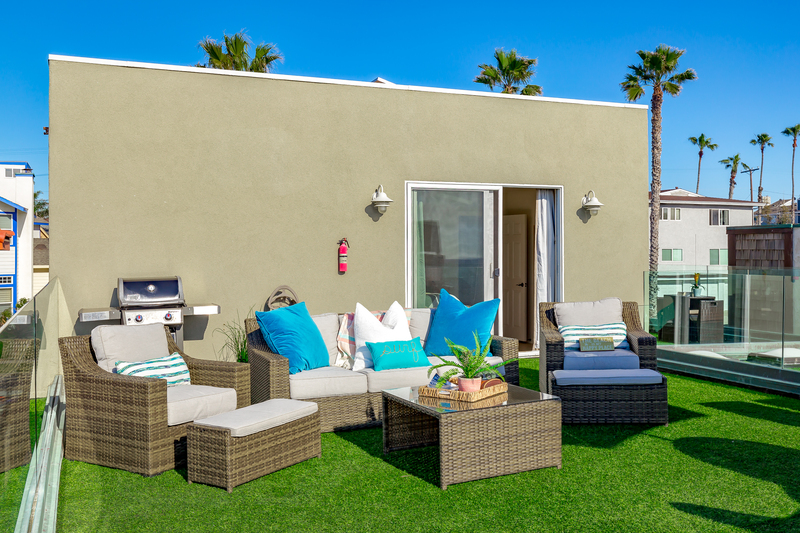 We love the rooftop deck. All the bathrooms makes it very convient for guests. Large kitchen with tons of seating. The view is spectacular. This was our third visit this year! Accommodates a large group very nicely, assuming some are willing to sleep in the "bunk room." We bring in all our supplies & don't leave for three days! Would highly recommend the property. 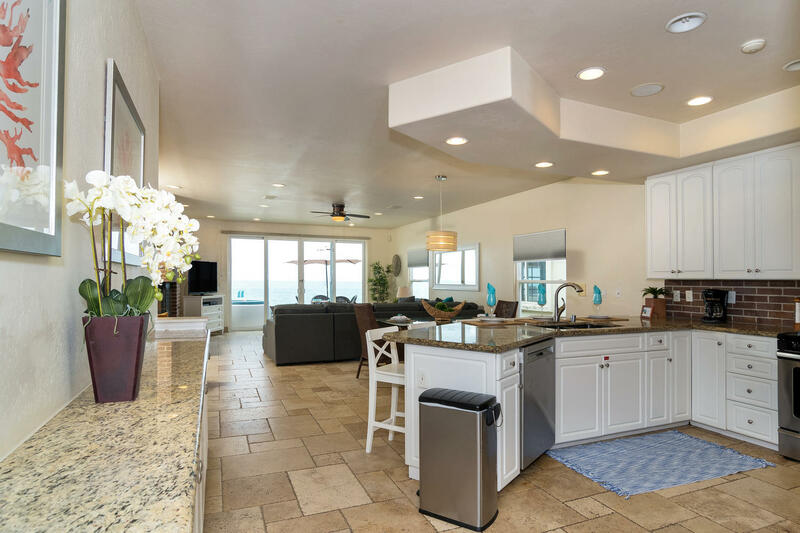 Very nice, clean and well equipped beach house for a week of family beach fun. The private spa and fire pit were used every day. Loved the gated entrance for security and the easy access to the beach. Had a problem with the fire pit and the management company had a new one on site quickly. Very responsive. Our family of (8) adults stayed in this amazing rental for our Christmas gift! 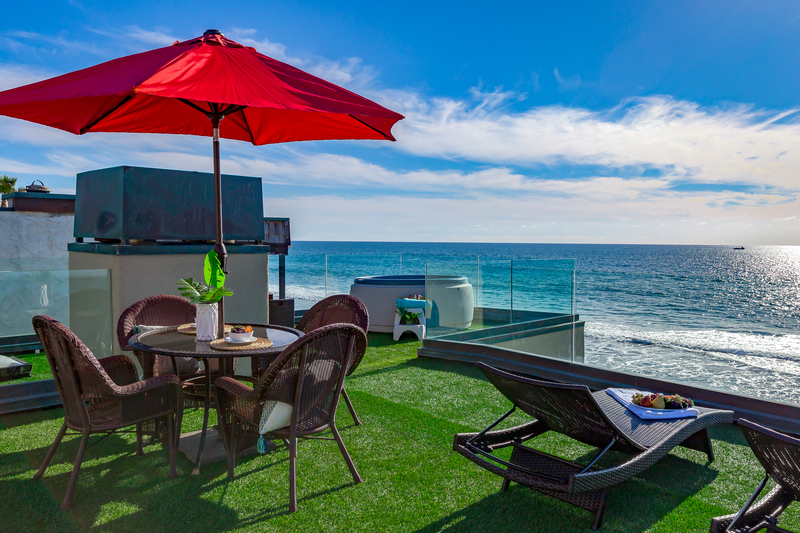 This property was clean, spacious, and boasted amazing views from every room. We had a small issue with the heat, which was addressed very quickly. We would highly recommend this property and hope to return ourselves one day! Thank you BeachFront Only for another wonderful vacation experience! The house was beautiful. 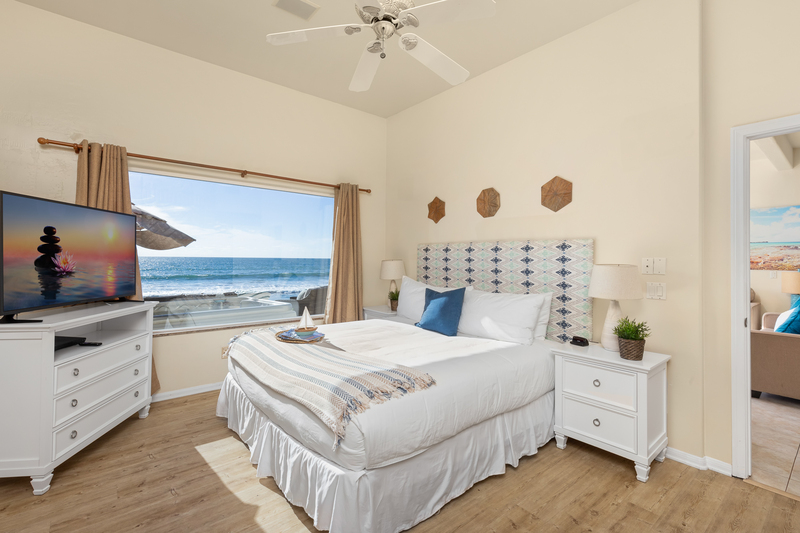 Unfortunately there was some home improvements taking place that we had not been made aware of---however Beachfront Only was very attentive to our concerns and took necessary steps to make us happy. The pictures of the property were very accurate and in the end our stay was quite wonderful. Have decided to book again with Beachfront Only, however this time will rent a private house. We stayed here with our family of 12, ranging in ages from 60 to 7. The condo was clean and there was plenty of common space to spread out. The view was spectacular and seeing my grandson's face when he got his first glimpse of the ocean from the patio doors was priceless! The location was perfect and we rented beach cruisers and made good use of them. The decks are spectacular and really a selling feature. We watched dolphins every day and during low tide there was plenty of beach to boogie board and surf. Thank you for helping to make a great family memory. This was a great property, however we had a few issues during our stay. Overtime our downstairs neighbors were cooking anything inside the house, our entire unit would smell. One night our neighbors burnt their food and we had to keep the windows open all night, 2 stars for the poor ventilation in the unit, as well we were missing hair dryer and ovens did not work properly. Dear Erin, Thank you so much for the review and feedback. We weren’t sure what to expect with the pictures looking so good online, but it’s just as the pictures show. It was clean and spacious. The house was stocked very well- beach towels and regular towels, extra sheets and blankets, games and puzzles, toilet paper and a well stocked kitchen. Bring your own spices as there is only salt and pepper. We had 14 people and everyone had a bed and slept well. The young adults said the bunk beds are a little hard but still slept ok. There were plenty of bathrooms and having a washer and dryer on-site is super appreciated. When tide was low, the younger kids could walk out and play on the beach. The pebbled beach area had smooth rocks but a little further out in the water was sand. At regular and high tide there was no beach area to walk on. The water came right up to the steps. The crashing waves were so peaceful and the view from both decks was amazing!! When we have a large group, this would be the place we will stay at again! It was so easy with the codes for entry and you are even provided garage door openers! The small details were attended to and it made this place a great stay for our family. We loved this property. The rooftop deck was spacious and açcomadating. The view incredible from both decks. Big kitchen and lots of seating. We celebrated my granddaughters 15th birthday at the condo. The bunk bed room had double beds and a pullout bed. Easy access and parking for two cars. Beautiful!! We have stayed in this rental and absolutely love it. It is a beautiful house and is in a great location. The beach comes and goes with the tide but we were able to enjoy it. The sunsets are breathtaking! Can’t wait to come back and visit. Had a great experience. Condo was clean and as described. Management company was wonderful as well! I could not have had a better experience with the booking team. They thoroughly answered my questions and helped me and my family pick the perfect place for our family gathering. It is a spectacular house with an amazing view. It was just stunning. This is our fifth year renting this house. It was amazing as usual! They made it even better by adding a firepit on the roof. I said every year how nice it would be to have heat lamps or something so the patio could be utilized more. 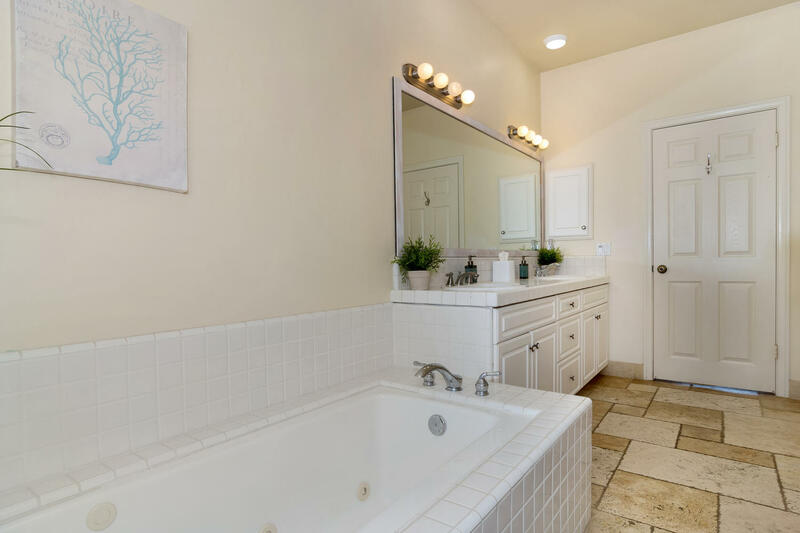 Love that three of bedrooms have their own bath. Suited our needs perfect for having two families share. I love being right on the beach and not having to drag my stuff from a hotel. I'm so spoiled with Beachfront I don't think I could travel to Cali any other way! Open and spacious layout great for family getaway. 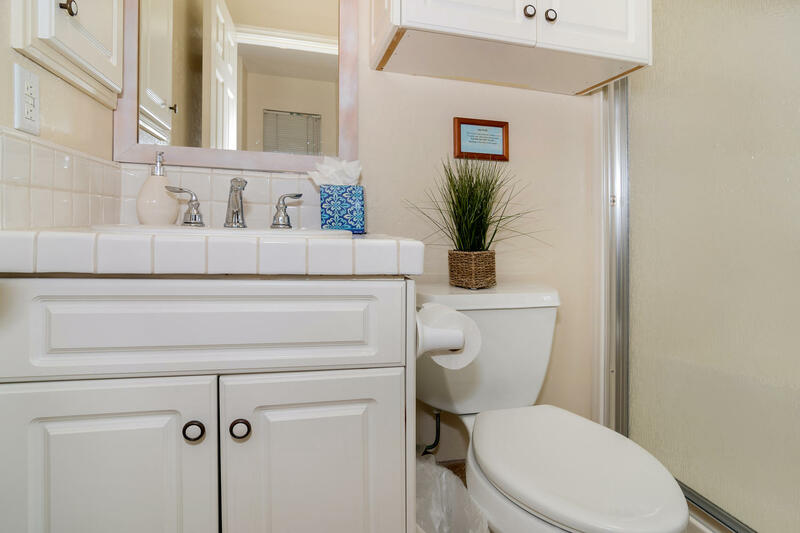 Close to Legoland, SeaWorld and Ruby's on the pier in Oceanside. 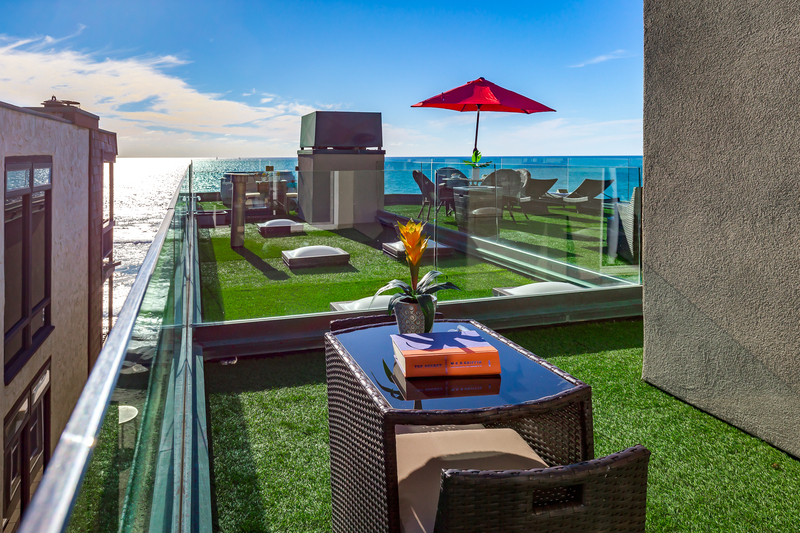 Great views of the oceanfront from main level balcony and rooftop lounge area. The rental exceeded our expectations. There was ample space for 5 active children and 4 adults as well as close proximity to the beach which allowed freedom for everyone to enjoy. The rental company was professional and the people staffing the phone were able to address all of our concerns and complete the description of residence that may not have been completely clear online. The place was immaculate and even though we brought additional paper supplies, soaps, etc., there were adequate supplies in house so we did not have to use our own. 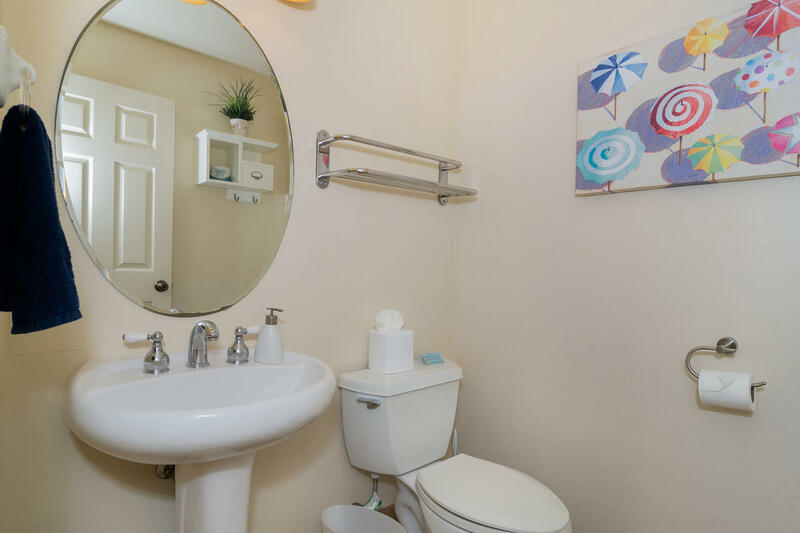 I chose this property because I had been in a similar rental 5 years ago, which was not available. This one was much more modern with every amenity available. I did not leave to shop or eat out the entire time because I was overwhelmed by the tranquility afforded by the crashing waves and unparalleled beauty of the location. The rental was amazing, very clean and plenty of room to relax. We enjoyed our stay with the beach just right off the patio. Also a very quiet neighborhood and very peaceful. I loved our vacation home. I do a lot of research before I rent a place. And this place was perfect for my family of 7. The kids loved the fact that it was within steps to the water. I loved the fact that it was quiet and romantic during a stroll down the beach with my hubby. What a fantastic way to celebrate a milestone anniversary and visit Legoland nearby. I wish we could have stayed longer. I would give a a better rating but the water in the hot tub was cold and the house needs a good paint job outside. This beach house was absolutely beautiful. From the moment you arrive you feel at home. As you round the corner from the entry way and see your first view out the balcony your breath is taken away. It is even better than any picture from the website. The house was immaculate and had everything my family of four needed. 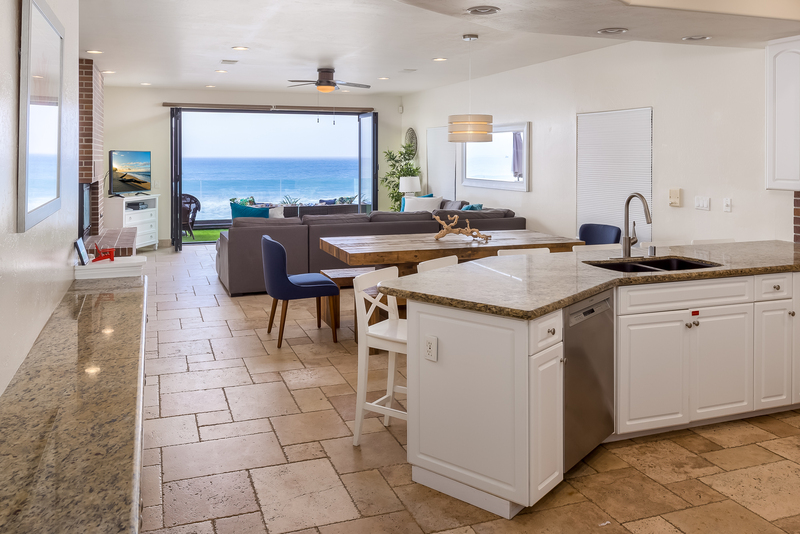 We stayed in many nights during our stay and used the well equipped kitchen to cook our meals and sit on one of two private balconies overlooking the picture perfect ocean. We also used the BBQ and fire pit on the rooftop balcony for steaks and s'mores. We saw Dolphins almost everyday we were there over our week stay. Just sitting on the balcony reading or watching the crashing waves was truly a wonderful vacation. The downstairs master bedroom is perfectly placed. 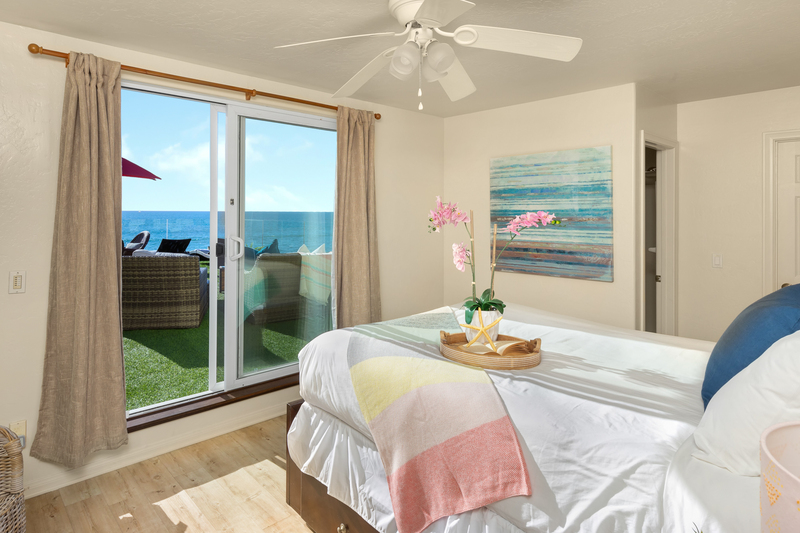 While lying in bed you can listen and see the ocean looking out a full wall window. The room also has access to the balcony. The upstairs rooms were also beautiful. My son loved sleeping in his own bunk bed. The beach was only a staircase of steps away. Easy enough to run back and forth for a snack or drink. The tide was especially high during our stay so we had little beach area. I know that changes often but we were still able to play in the water, just couldn't play in the sand. Only a few blocks away we could walk down to the pier where their beach area is much larger. Also, Ruby's is a fun place to have breakfast or lunch. 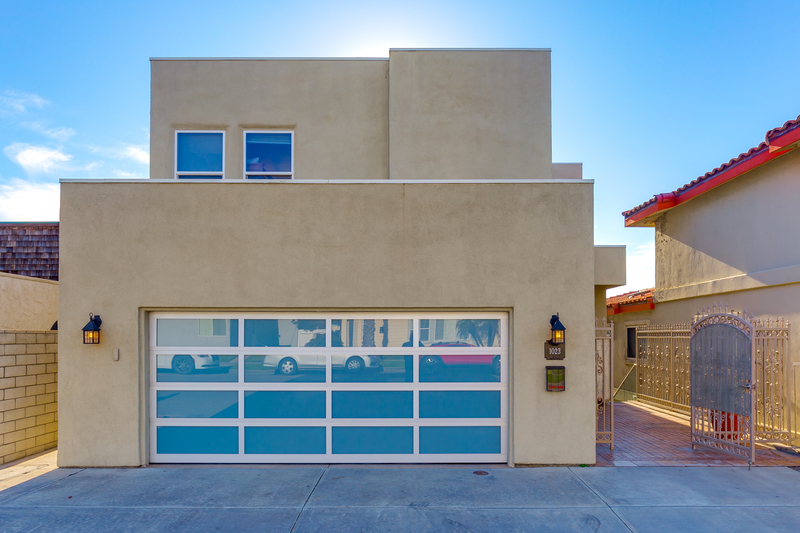 The house is located directly on the beach but also situated where you can get out and walk in a safe area on sidewalks. We also were able to walk to breakfast, coffee and Rite-Aid which was very convenient. We loved staying at this beautiful beach house and had a very difficult time leaving. The service was perfect. The app for all the information you receive after you pay is wonderful. Filled with all the information you need for your stay. We can't wait to stay here again!! The beach home is huge. Lots of room and the location is great. 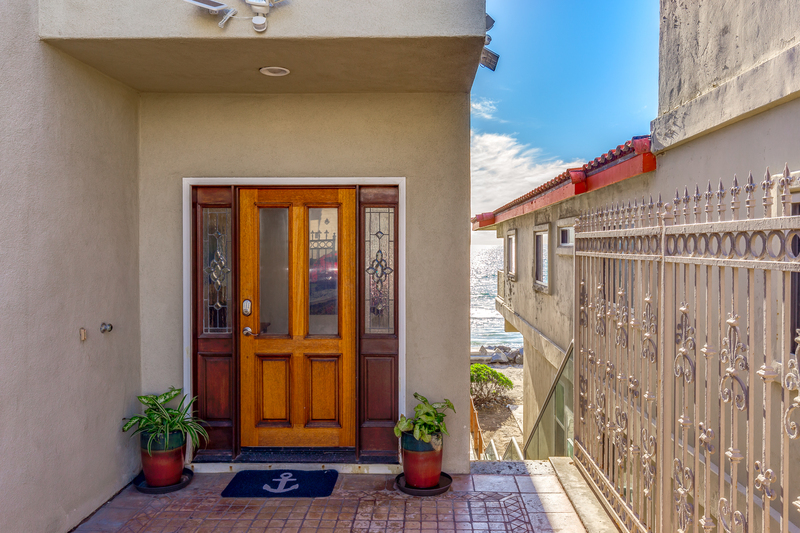 Easy walking distance to the pier and direct access to the beach. 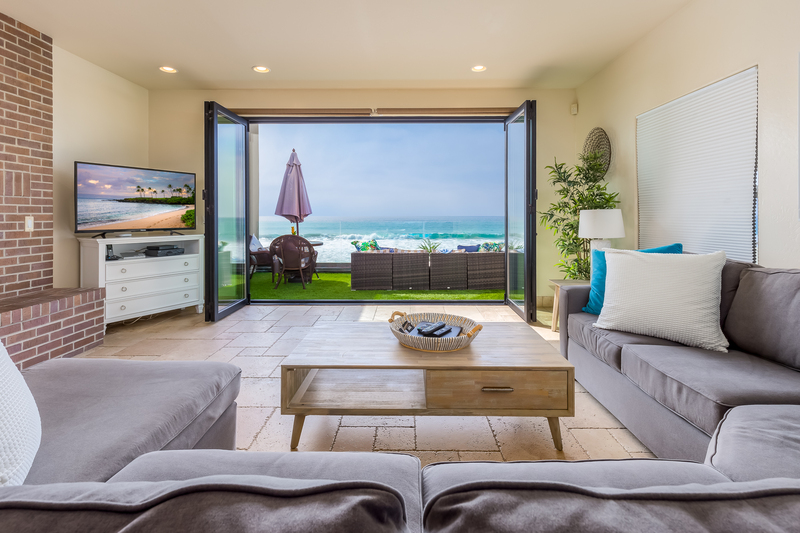 I have rented many beach front houses along the coast in California and not one has been better than this house, very well appointed, can't get a better view, the fireplace's were awesome in the cold nights, the garage is a nice touch too. Loved it! Didn't want to leave!!!! We rented this beachfront home for a family vacation. We were 2 families (11 people) and this home fit all of us easily and comfortably. We were short a few towels and forks the first day but a quick email to Beachfront Only and we received a phone call that evening advising that the towels and forks would be dropped off in the morning. The location was great, right on the beach and just a short walk to the pier for milkshakes. Something to note is that there is a train that runs nearby on a regular basis, day and night, but it didn't bother us. It would have been nice if they would supply just a few simple beach toys but we made do with items purchased from the nearby 99 cent store. 2 washers and dryers was a nice extra. We had lots of starter supplies of soap, toilet paper, laundry detergent, garbage bags, etc. The home was very clean when we arrived. Prior to booking, the layout on the website was confusing as there were 2 layouts that were different. An email to Beachfront Only and it was clarified. Although when we arrived there were 2 sets of double over double bunk beds in the upstairs room not a bunk bed and king sized bed. This didn't worry us as it actually worked better for us. Short drive to LegoLand and about 30 min drive to SeaWorld and San Diego Zoo all of which we visited. Also had a lovely 'adult' dinner out at 333 Pacific! Would definitely recommend this house to any larger groups. Beautiful location, outstanding outside areas on each floor. Cellular signal is only 1 bar but using wi-fi helps. Bring extra hair dryers if needed only 1 in unit. Also bring toiletries. You are only supplied a travel size bar of soap in shower. All appliances, fireplaces and electronics worked great. Home was cleaned very well upon arrival. Did have some issues with lower unit renters blocking access to property garage, placed call Friday to BFO and no call back until Saturday afternoon. A quicker call back would have been appreciated with they're contacting the renters. We had to handle and the renters were not very pleasant when asked to move cars. Overall, we would recommend this rental highly to others. And we will rent again using BFO in the future. Loved this place and the easy beach access. We could sit on the terrace watch and take pictures our family boogie boarding. We could walk to restaurants. The house was very commodious with the possible exception of the bunk bed room. The ceiling fans were too close to one of the top bunks so no one could sleep there. Otherwise, all good. Had the time of our lives! From the moment I walked into the home, I already knew it was perfect! From the layout to the wonderful views on the rooftop, it had everything we wanted, and to top it off, it was the perfect setting for my engagement! Plenty of space, lots of toiletries, and extremely clean and comfy! Also, the entire staff at BeachFrontOnly are all professional, courteous, and very helpful in the entire process! Everything was wonderful! 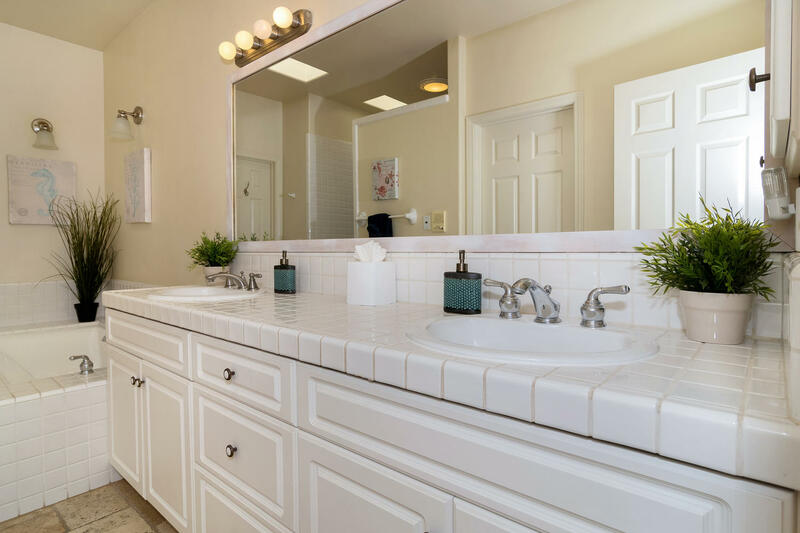 The house is like walking into a model home, it's clean, fresh, beautifully and tastefully decorated. All the appliances and furnishings were top notch. 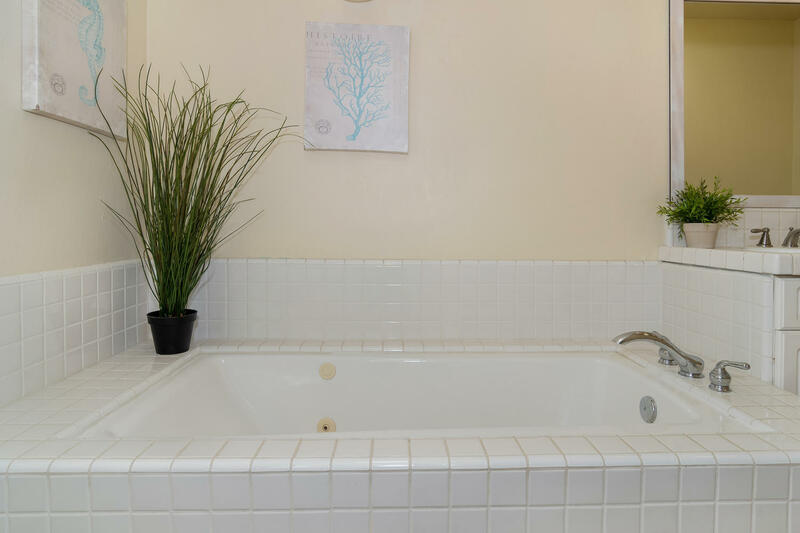 The jacuzzi is nice for after an ocean swim, and the street level entry and garage are an easy access. The beach access is great! Down some stairs, and you are on the beach. 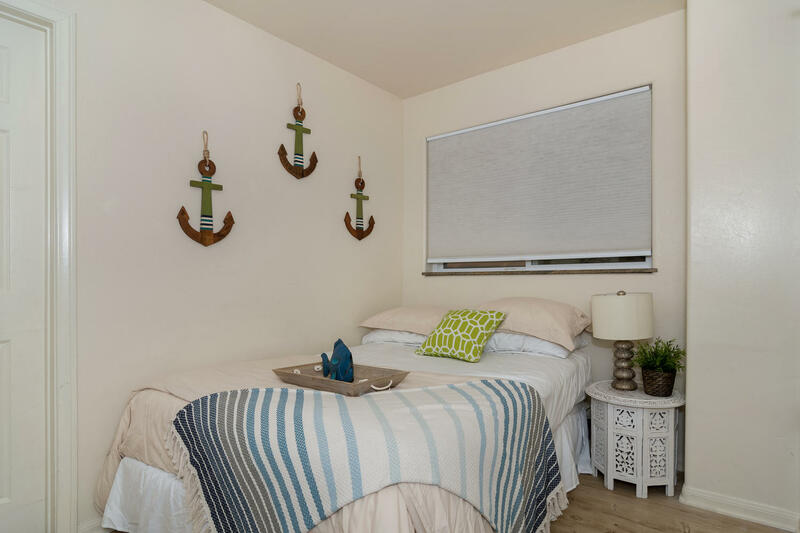 The upstairs bedrooms are nice for guests or teenagers that would like some privacy. The gas barbecue is on the upstairs deck away from the kitchen and you have to go through a bedroom area to get to it making grilling inconvenient. Again it was inconvenient to use the upstairs deck for the large seating area. The gas fire pit is nice, but again in order to enjoy it, you have to go upstairs and through the bedrooms. There were no TV's upstairs. Overall we had a 5 star vacation. It would have been nice to have a grill on the main level, and a separate TV for upstairs. This was such a great place to be able to celebrate my Birthday. The view, the house, the surrounding area...all amazing! I will be back for sure! We had a wonderful time with our son and daughter and their families (total of 10). Everything was really nice and as advertised. Great location, great views, great facility. My only complaint is that the amenities were a little light for a $1000/night property (bath towels, beach towels, kitchen towels, soap, bath tissue). Other than that, we were very satisfied. excellent, however online & verbal descriptions did not match property wrt bedroom layout & beach access, so this caused initial disappointment. We enjoyed this property for the second time in 2 years. We love being so close to the water. The house was just what we expected. 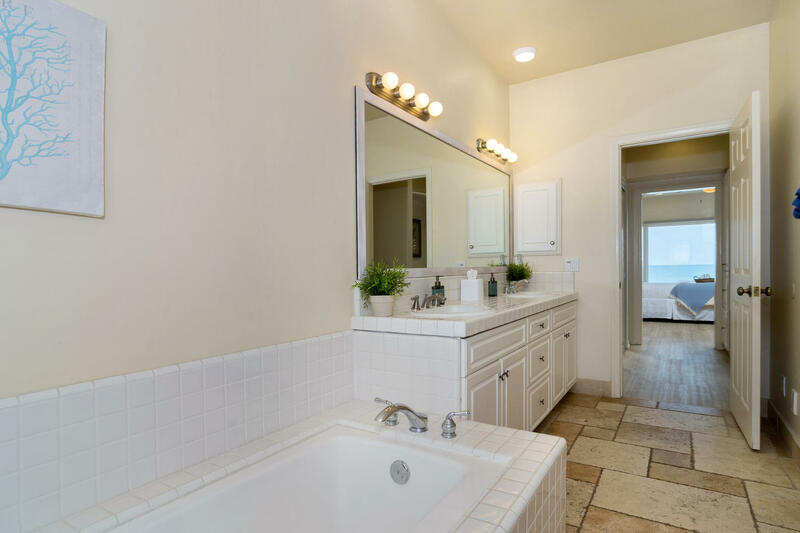 It could have had a few things worked on like the master bath fan and lighting throughout, but all in all a great place to stay. We loved our stay at this beach house. It was wonderful to walk onto the beach whenever we wanted and the views were amazing. The whole house was comfy and had plenty of towels along with everything else we needed during our stay. We had a wonderful stay at the condo, very comfortable and absolutely the best location. Kitchen and living room spacious and nicely furnished. Carpeting definitely needs to be replaced and the bedding could be upgraded. All the rooms could use TV's also. We would stay there again because we had a great time! Great weather, great house, lots of fun!!! Our jobs of raising responsible, productive children has been accomplished. Our mission now in life is to MAKE memories... and this beach house with the ocean at our door step accomplished just that for this year. The minute we walked into the property, each of us were blown away. It was everything each of us had hoped or wished for! We had wonderful times, cousins playing, laughing, joking , relaxing and enjoying each other's company. Lots and lots of memories were made this week, we will always cherish this vacation. We had a wonderful time and were impressed with the rental property and the location. the rental management personnel did an excellent job in assisting us and helping to make our stay delightful. We will definitely be recommending this property to others who are seeking such a unique experience. Only thing is that we got locked out before our check out time & had to callto get in. 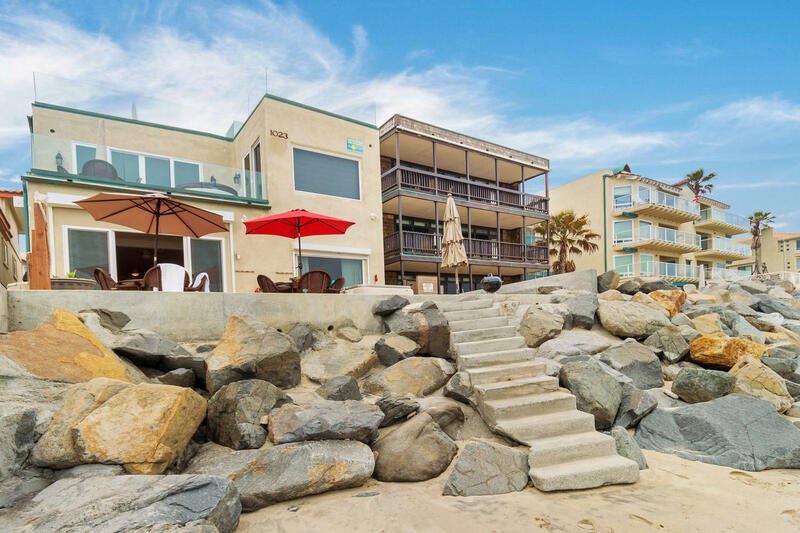 A beautiful home right on the sand! We had a wonderful girls' weekend at this property! The gourmet kitchen and dining area were perfect. The beds were super comfy. Beach towels on the beds was a cute touch. The roof top deck with lovely chairs and tables, and the patio with the hot tub off of the living room were awesome! Great views of the sand and waves! 2 car garage with door opener was super convenient! We loved it and hope to come back! Two notes, we brought our own bluetooth speakers for music, and thank goodness for the free wifi, as none of us with AT&T had cell service! 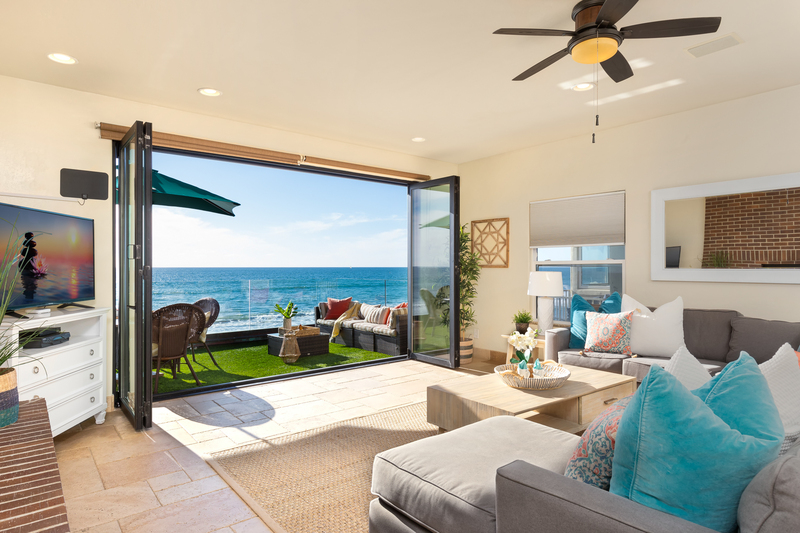 The first time you walk in and see the ocean right THERE... it will take your breath away! We didn't see one bug or spider the entire time. The area seemed very safe. Lots of women walking/jogging by themselves at all times of day. All the doors had huge inside locks so no one could break in. Had no problem with check-in/out. The sound of the waves was constant and soothing. Hot tub was great for 2-3 people at a time. Sunsets that I will never forget! Overall it was awesome! Thanks BeachFront Only! 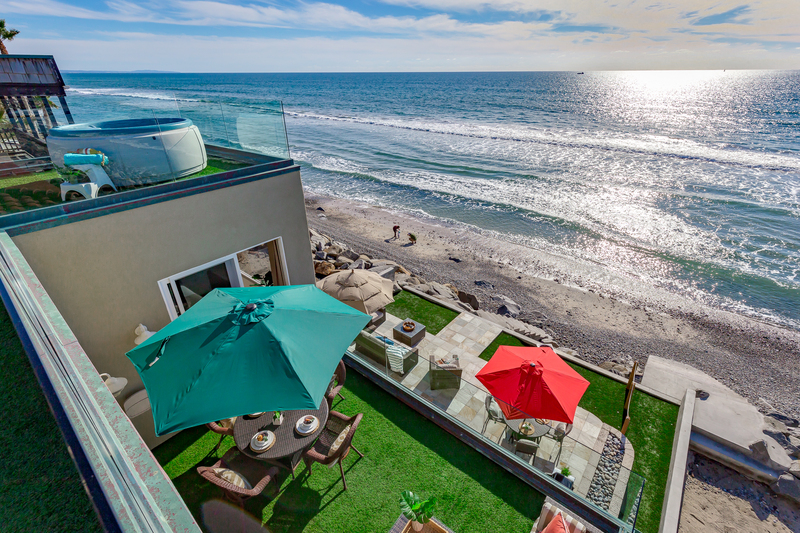 The house is spacious, right on the beach. There were a few maintenance issues but nothing significant. It is quite expensive but I think oceanfront in California is all like that. The kitchen was furnished with bare essentials so it was a little difficult to cook. The house was wonderful for a group, and I would definetly rent it again. This was our 3rd visit to this property and we were once again very happy with our stay. The recent updates were nicely done. The property was very clean and well maintained. We stayed here with 8 adults and two smaller children and were comfortable. 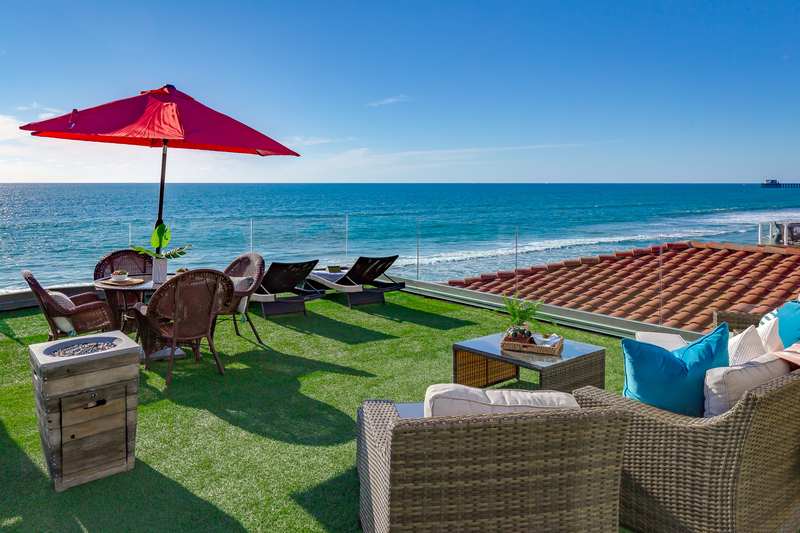 We like the roof top patio and the fact that you can walk down the steps and be on the beach. We had a very minor issue with the door between the upper and lower rental units not being locked when we arrived and the service staff was there within a few minutes to take care of it. Everyone we have worked with at Beachfront Only has been very helpful. Our second time back and we really enjoyed it again. We liked the new bedding updates from last year! Only 3 traveler recommendations: lounge chairs for top deck, TVs in upstairs bedrooms could be added(esp if kids want game time) and a few more kitchen gadgets/glass tupperware. We will be back in 2016 for sure. We go to this location every year with our two children and their families. Always a great time and wonderful location. We are already booked for next year. We were not disappointed!! The home was beautiful and spacious and well appointed with everything we needed for a perfect family vacation! Friends had a amazing time but me not so much. I slept in the masterbed and attracted bed bugs. Definitely a beautiful place but they have a small infestation issue. Beautiful location, on the sand, no boardwalk. Just walk out back and start building sand castles. The rooms were spacious and clean, bathrooms were nice and there was plenty of hot water for the kids numerous showers. 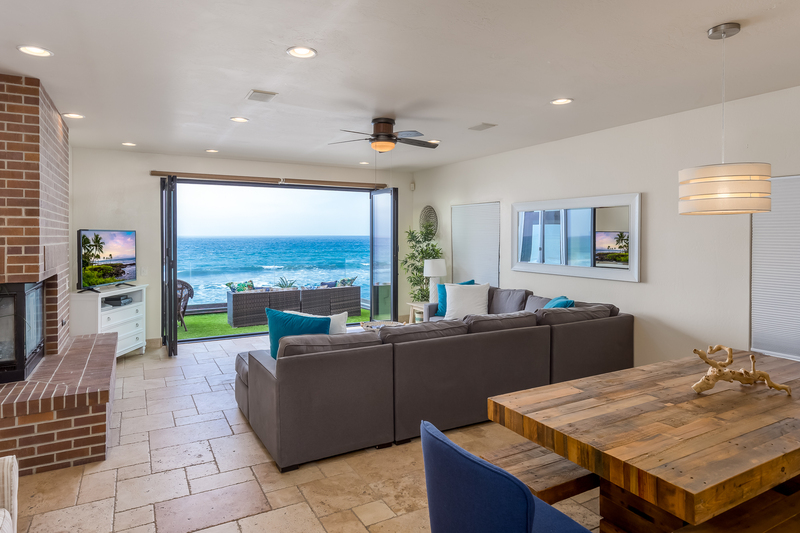 Nice big open space for the kitchen/dinning/living room with excellent views of the beach and ocean. We saw dolphins and whales from our deck. Roof top deck was excellent with glassed walls to block wind, but not your view while lounging in the sun. 'This was the most relaxing vacation ever', said my wife as we left the property. We will definitely be back to BFO, maybe even this property. My Family 6 adults and 3 kids 2,5,7 stayed at your beautiful condo,we loved how close it was to the beach , the washers and dryers in the unit, its the living room ,dining room and kitchen are huge ...bigger than I thought.. the bedrooms are spaced well and so nice we all had our own bathrooms... it was big enough that we all had privacy but cozy enough for family time. the only complaint for me was we we not aware of the fact that it was 2 units , at first we thought the whole place was ours until the other family arrived with way too many people for the size of it, the kids were rather wild. but anyway the hot tub was also a hit. we had a blast and would stay there again. Our grandkids ages 4,6,7 had a wonderful time. the accommodations are outstanding. Lots of room and plenty to do. This is our second trip here and will do it again. The jacuzzi has a very difficult time staying hot. We did everything we could to help it. Maybe it is just getting old. The sink in the master bath had one drain that didn't open/close. The master screen door latch is very rusted and hard to keep closed. There used to be 2 chairs in the TV room that were missed. It would be nice if each of the main bedrooms had a TV. There used to be one upstairs and now there is only the extra in the master. We love this place and will return for sure. I was just hoping if you were notified of a few problems, they would get taken care of. Thanks for another wonderful vacation. We will be back. Had a great time relaxing and enjoying the view. This was our second time staying in this unit. We will we back. We wish we could have stayed for another week. Amazing location. We had a large group and there were plenty of beds for everyone. I would just make sure we bring more items we would need for cooking or bathing. We got use to other rentals providing complementary lotion, cooking oil, etc. We couldn't have asked for anything more! The set up exceeded our expectations. Very clean, everything worked as promised. We hope to do it again. Great rental for multigenerational guests. Parents with babies slept upstairs. Grandparents downstairs. Lots of bathrooms. Double washer/dryer was a huge bonus. 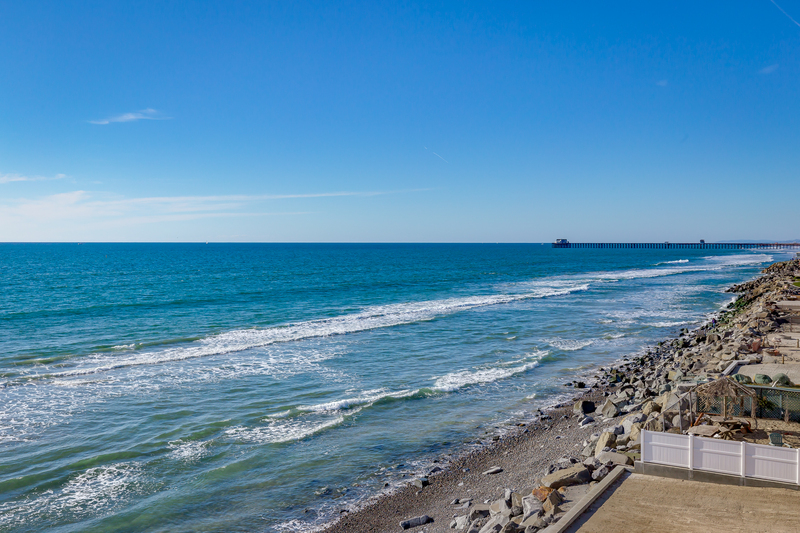 This is one of the best locations in Oceanside. Not on the Strand, but still beach even at high tide. It's halfway between the public access streets, so it's gets limited public use. Basically walking through lower occupants sitting area to access beach is a little odd. We had great renters below us, so it was not an issue. Warning. No beach furniture. No chairs. No umbrella. No toys. Consider this a must. A few minor maintenance items that did no affect visit, but should have been addressed earlier in a property at this price point. Would definitely rent this place again. What an amazing experience!! After being stuck in traffic for hours I was beginning to think I made a mistake... But the we arrived to the beautiful and spacious property and the wonderful sound of the ocean! It was worth every second in that traffic! Our party of 11 had plenty of room, the beach was right down the steps and I'm pretty sure we're coming back next year! Thank you for this fantastic experience! 3rd time in this house. This time we had the best weather ever! We love it and the location. Hope to be there next October again. Wonderful time at the condo, spectacular view and location, will be back next year. thank you. Fantastic service and attention to detail from your company. We love this property. It is the third time we stayed here and plan on going back again. This is yet another repeat stay for us at this wonderful home. 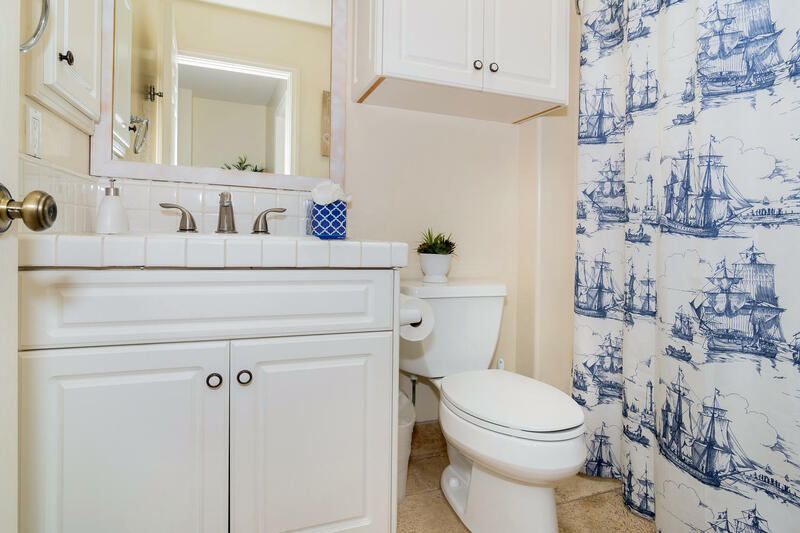 Easily accommodates our large family of 3 adults and 4 kids plus occasional visitors. Right on the beach, and a comfortable walk into town. We picked a week in September, so it would be less crowded. We nearly had the beach to ourselves! It was so beautiful. Coastal weather is unpredictable,unfortunately we had a couple cool days, but made the most of it. We loved the upper deck. the views were amazing. Beautiful home! Breathtaking ocean view. One of the most relaxing vacations we have ever taken. Stayed three days, wished we could have stayed longer. Plenty of room for the family. Comfortable and clean. The property management staff was very courteous and helpful. We will definitely be vacationing here again. Thanks for your hospitality! I found this proprety because My 6 year old granddaughter's request for vacationing in California was to stay on the beach and collect her own seashells. Being from NE, staying on the beach was such a fun experience for the whole family....The house was perfect; extremly clean, comfortable and accomodating to all our needs. Our only complaint was that we could not stay longer....We will recommend it to everyone we can and will definitely be back again! The house was great for our family, including our kids and grandkids. Ample sleeping space and bathrooms. 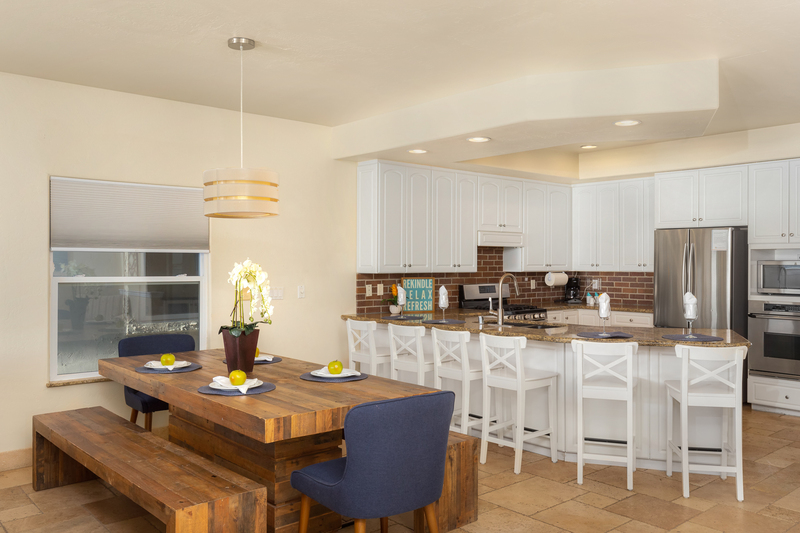 We loved having a big open kitchen, dining room, and living room combination. Ate all meals at home. The grandkids loved the hot tub and playing on the beach and in the waves. We would have enjoyed a wider beach as we had no sandy area when the tide came in. Everything was clean and in good condition. Plenty of towels and products in the bathrooms and kitchen. Best Vacation we've had! The house was gorgeous! We hated to leave to go anywhere! The kids were busy from beginning of day until the end! Loved the beach and the hot tub. The views from this house were stunning! We booked our next trip before we even left property! The house had everything you needed for a fantastic vacation. I just wish checkout was a little later or check in was a little earlier. We just didn't want to leave. My family and I stayed at this beach house for a week and enjoyed every minute. The property was very spacious, clean, and the views were amazing. We would definitely stay here again in the future. The only thing we would do differently is stay during a different season. Summer or fall. Spring was a little bit too cool and overcast. I highly recommend this property to anyone! Our Grandson's first trip to the beach and it was terrific. Accommodations were great. My only complaint would be some of the screens would not close due to rust so a few flies. The house was beautiful and very clean. The view was breath taking. The beach was rocky and very small but adequate. The property management staff was incredibly helpful. We will definitely go to them for our next vacation. It was our third time there and we had a great time ,,What a great place............... The weather was great and the home was great. I guess that makes it a great vacation..
We had a lovely and relaxing stay in Oceanside. The view was awesome. Dolphins, surfers, pelicans and fishermen kept us entertained along with the beautiful view of the ocean! We enjoyed the fireplaces in the living room and the master. The rooftop deck was great only it lacked adequate'lounging' furniture. The deck is huge and could handle 1/2 dozen or so. All in all we had a great time! This was perfect. It was easy to book. No fussy check in or out. House had everything we needed, and then some. Location was perfect, charming neighborhood. My whole family was more than satisfied. I will definetly be using beachfrontonly again. Perfect for a large family and for kids! Such a perfect place for our family. The property had lots of space, let us all spread out. Beach was nice and quite perfect for us with small kids. Had so much fun, would love to stay here again! Best vaca ever. We are coming back! Thank you Beachfrontonly! No hustle check-in and check out. Instructions were easy to understand and with the convenience printing from email. Great oceanfront house!!! This was our second visit to this property. Love love love it! We were 2 families sharing the rental and it couldn't have been better! More than enough space for privacy and perfect size area for hanging together. The beach was fabulous. We sat on porch having coffee in the am and saw dolphins swim by. The kids never even asked to leave because of the beach! Dinner on the roof patio is fantastic! Couldn't have asked for a better family vacation! Condo was in great condition. 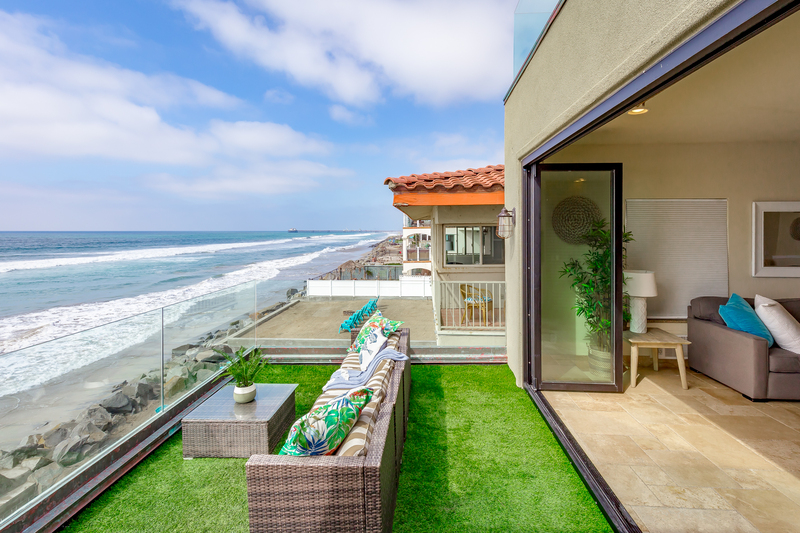 Beautiful beach view from both decks. Proximate to good food, Legoland and the pier. The house was perfect in every way. Loved the proximity to the beach. Enjoyed swimming and walking the beach and being able to go to the house, wash our feet with the house out front and hop in the hot tub. Loved the fireplace in the evening, with all of the doors wide open enjoying the surf. Will stay here again one day! We have spent five years coming as a family to Oceanside CA for a vacation and finally found the house we like. It was well stocked and accommodated our family of 9. Definitely want to come back. My group of 11 grown adults racing in the Oceanside 70.3 triathalon had an amazing time at this property. It was within walking distance to the start of the course. We had plenty of room in the house for all our gear. Plus the kitchen was big enough for us to make a giant Easter feast. It was a great vacation and couldn't have asked for a better house! The property was PERFECT!! 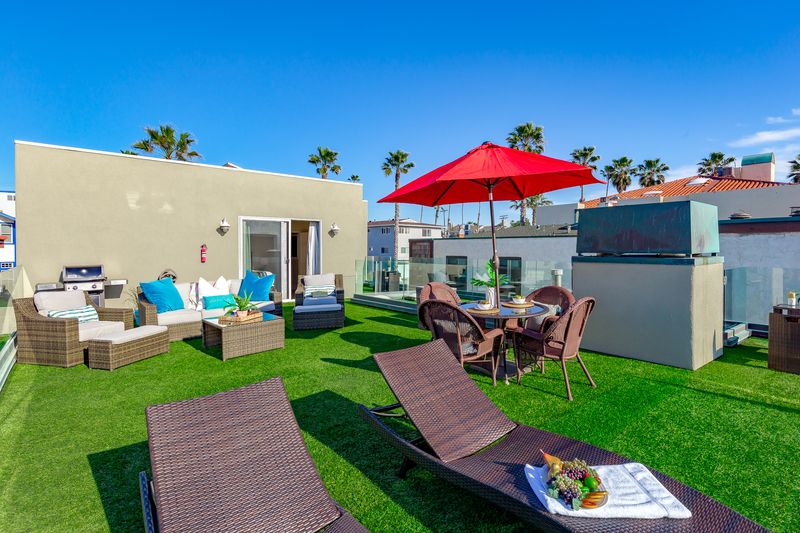 The quality of the property and all of its amenities was top notch. Would highly recommend this property! Overall it was great - again! We had a couple minor inconveniences (tv stopped working while watching the football game Monday night, but was replaced the next day) (a dining chair broke - actually repaired 3 and one couldn't be repaired) May be time to replace some of the blinds - the wands come off and are sometimes difficult to work. BUT...this is such a great location and the home itself is wonderful, these inconveniences were minor. Having a 2-car garage is a wonderful bonus! Our family will stay here again!! Love this home on the beach! We had a wonderful girls only getaway at this great home. 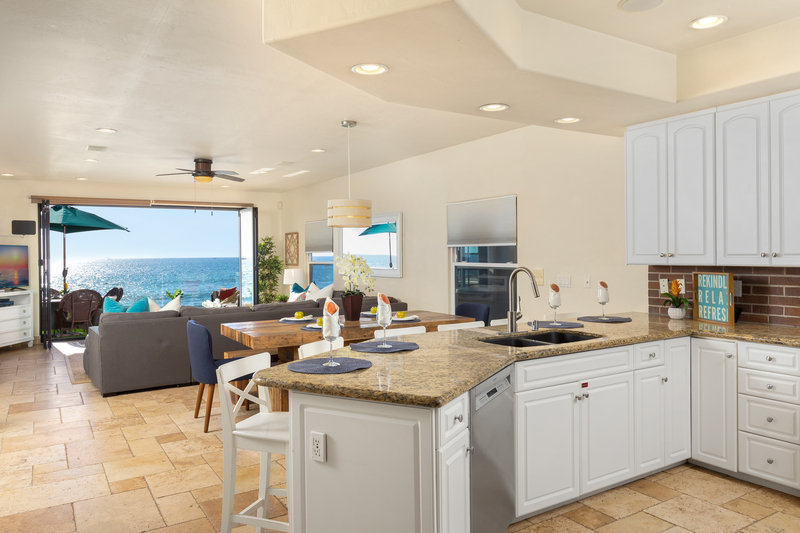 The kitchen was perfect for cooking and we loved opening the doors to the patio to enjoy the sound of the waves. The roof top deck was perfect for watching the sunset. We had lots of room and comfy beds. Definitely hope to come back for a longer stay in the summer. My husband and I stayed here with 5 kids and we all loved it! It was a beautiful house in a beautiful location. Quiet and very comfortable. Lots of beach fun. Close to pier with restaurants and fishing. No need to go anywhere else. Fantastic balconies to see sand, surf, watch teenagers, etc. also a nice beach for that morning exercise walk. this is our 4th time with Beachfront only and once again we loved it ... and we never want to go home , but we have to. thanks guys . 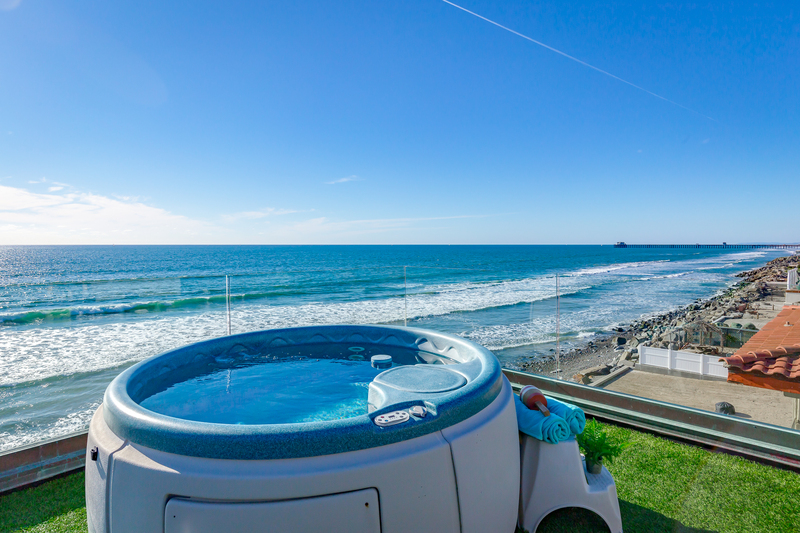 if there is one thing you could improve on it's the hot tub,it could be newer and larger. but all in all thanks we love Oceanside. and the home.. see you again soon. We had 3 couples and a couple random friends that stopped by for lunches/dinners each day and this property EASILY accomodated everyone. It was very spacious and the overall location and amentities were perfect. Everyone had a phenomenal time, and we talked numerous times about making this trip a yearly tradition and definitely wanting to stay at the same property. Absolutely great vacation rental for the overall cost/price!!! We stayed for spring break at this Beachfrontonly property and thoroughly enjoyed ourselves. From the thoughtful selection of amenities (e.g. 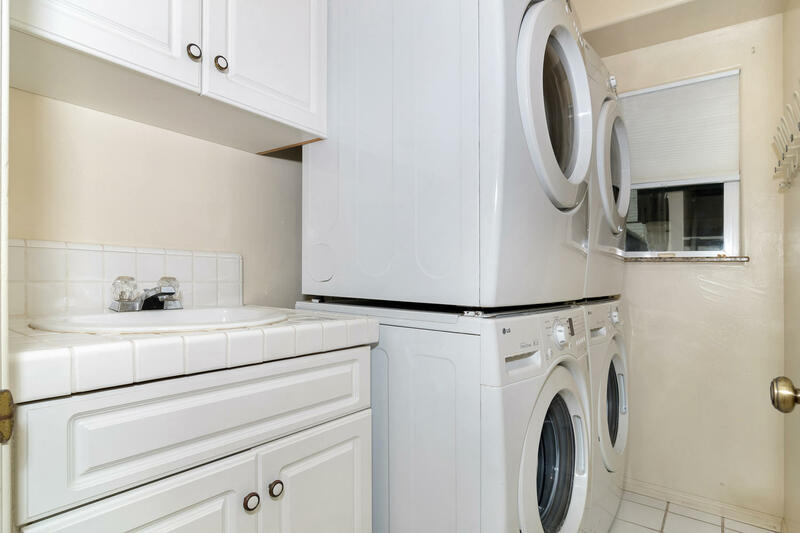 dishwasher detergent, washing machine soap, abundant towels, hand soap at each sink, full suite of kitchen accoutrement, etc.) to the well cared for property we felt as if we were at home (in spite of it being 20 minutes away). We didn't have to venture to the store for anything save more alcohol and food as our friends all came to see us. It was like being on vacation with your all our friends! I highly recommend this particular location due to the fact it has great beach access and there is a beach even with the highest of tides. My friends and our children had a fabulous, relaxing time in this beautiful property, overlooking the ocean. Well worth the money. My experience at Oceanside was wonderful. My family enjoyed it very much. We love the big balcony with amazing view. Children loved the walk on the beach and waves. The only thing bother me was the people burning wood. All the smoke smell came to our living room and room, so we had to close the balcony door. Overall, I love the place.